Did your CCTV security camera work fine but show white screens after months of usage? Or do your IR cameras display white screens or go white suddenly when IR kicks in at night? Today we explore possible reasons behind a white screen of your security cameras and provide helpful tips to fix the white screen problem. Some users said their CCTV camera shows a white screen until very recently. Before white the screen problem struck, the cameras were working like a charm. And others complained that their CCTV cameras suddenly show nothing but whiteness on the monitor screen in the daytime and sometimes the CCTV camera shows the white screen at night. What could possibly be the culprits of the security camera white screen problem? 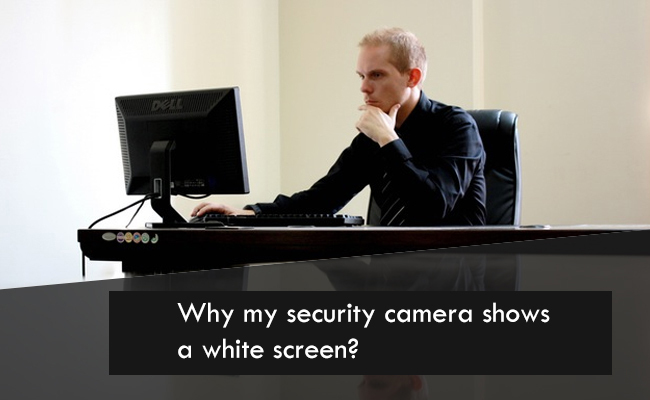 The White screen shown on many CCTV or IP security cameras can be caused by many reasons. There are some common causes for security camera white screen or whiteout during daytime or IR night vision CCTV camera image/video whiteout at night. Very often, when the security cameras are pointing at the reflective bodies, such as direct sunlight, mirror, a body of water, or other reflective surfaces, the images and videos captured by the security cameras will be overexposed with light, which is likely to wash out the entire scene. For example, security cameras that are placed at the parking lot entrance are prone to capture whiteout images or videos, especially when the flashlight of a car shines directly to the camera lens. Security camera with wide dynamic range could possibly experience white screen when pointing directly at the sunlight or reflective surfaces. Many IR night vision security cameras don’t work well when being placed behind a glass window, especially at night. IR light will bounce back to the camera lens, washing out the image. One of the main contributing factors of security camera white screen is placing your IR security cameras behind glass or window. To avoid such issue, place your IR night vision security camera outside, turn off IR light, or add an external IR illuminator. If your security cameras work fine for a certain period of time at daytime while they show nothing safe from a white screen, try changing security camera’s pointing angle, pointing them down or avoid mounting them to metal surface or spot with possible barriers. Many security camera experts point out white screen shown on CCTV or IP security cameras could be caused by sudden voltage drop or insufficient power supply. The insufficient power supply could result from faulty cables or inferior cables. 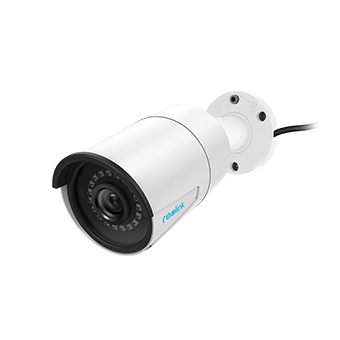 Old security cameras that have been in use for years are more likely to suffer from issues like white screen because the camera cable could be old and frayed, inadequate to provide enough power to the camera to function properly. The simple solution to the problem is to swap the old cable out. Make sure you are using quality cables for your CCTV security cameras, for example, Cat 5 or Cat 6 cables for IP security camera, RG59 Siamese cable for CCTV analog cameras. Besides, cable length plays a role in the security camera power supply. Make sure security camera cable is sufficient to provide enough power for your security cameras and the cable is properly wired around the house. Believe it or not, your security camera settings could be blamed for the white screen shown on your security cameras, for example, brightness and contrast. Users could go check out your security camera image setting too if the setting can improve image quality. Whether you would like to admit it or not, you’re CCTV or IP cameras could be faulty. Most likely, the image sensors such as CCD or CMOS could be damaged or degraded to some extent, so much so that it fails to capture enough light signals to provide a balanced image or scene. The best bet is to reach out to your manufacturers and seek assistance first before returning this faulty camera for a new one. 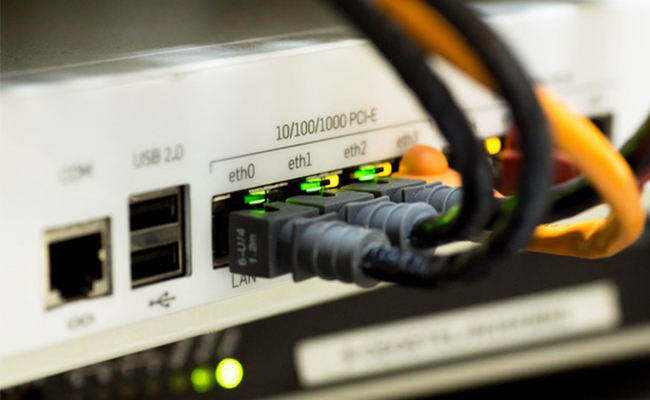 Many variables could potentially contribute to the white screen on security cameras, similar to video loss, for example, cable type, cable length, network, connection, power supply, connector, splitter etc. If you have your security cameras connected to a DVR or NVR, try unplugging the camera in question and plugging it into another port to see if the problem still exists. If the camera still shows completely washed-out or white images, then the problem lies somewhere else. It could possibly be the connection between the DVR, NVR or PoE switch/injector and the monitor or TV. Or simply a compatibility issue when users are using cameras of different brands with NVR or DVR of different brands, or on a third-party software. First and foremost, users should purchase reliable IP cameras/systems from trusted and top CCTV camera brands. Decent security cameras, such as RLC-410 PoE IP camera, which could never be overstated, go a long way in providing you’re a true sense of security and peace of mind. Original cables that come with the package are most likely to the type of cables that users should use and replace in time of need because the cables are frequently tested and examined to provide better performance and durable enough to last longer. This entry was posted in Pro Tips & Fixes and tagged CCTV white screen, fixes, no images, reasons. Hi there, make sure your CCTV camera is not getting electrical interference or power spike. Hi, Carin, if the lens of your security camera is an auto-iris type, it could be that the lens is stuck wide-open, so the picture is washing out in the daylight.